Despite being a coastal city, New York can’t boast the same huge stretches of beautiful beaches and sandy shorelines of other coastal locations like Los Angeles or Miami. Nevertheless, the city does actually have a stunning set of beaches, beloved by New Yorkers and tourists alike, and one of the most popular of all can be found in Jacob Riis Park. Jacob Riis Beach, also known as ‘The People’s Beach’, is a highly popular gathering spot for locals and travelers alike. With the Big Apple being best-known for its busy city streets and sprawling metropolis, places like Jacob Riis Beach offer a nice getaway from the hectic hustle and bustle of the downtown districts and major tourist attractions. 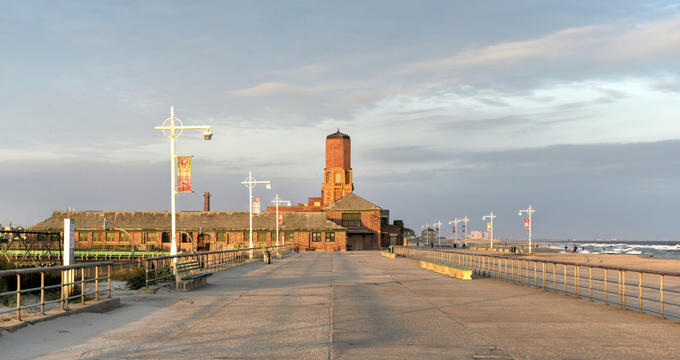 Many first-time visitors to New York City aren’t even aware of the existence of Jacob Riis Beach but absolutely fall in love with the place on first sight. Recent renovations in the area and the opening of new concessions back in 2015 have helped raise awareness about the beach and make it more of a popular spot, but even on busy days, there's more than enough space at Jacob Riis Beach for everyone to find their patch of sand and enjoy a relaxing moment on the shores of NYC. Jacob Riis Beach is part of Jacob Riis Park, which was built back in the early 20th century and named after a journalist and photography who pushed for the park's creation. The area was actually used as a military base for some time and struggled to gain too much popularity, but was turned over to the National Park Service in the 1970s and made a big comeback. Well-known for its beautiful Art Deco buildings, including a bathhouse that was constructed back in 1932, the park is a highly popular recreational area featuring a wide array of concession stands, a pitch and putt golf course, a boardwalk, basketball courts, and various play areas for children. Jacob Riis Beach is one of the most popular parts of the park and is entirely situated on the southern side, facing out to the Atlantic Ocean. The beach is divided up into 14 individual bays, with each one being separated by jetties and rocks. Each bay is numbered, with Bay 1 at the eastern end and Bay 14 at the most westerly point of the beach. The most popular part of Jacob Riis Beach tends to be from Bay 6 all the way down to Bay 14, and this area is served by several concessions and amenities. The art deco bathhouse of Jacob Riis Park can be admired from Bay 4, and the first five bays are situated by the Neponsit Beach Hospital. Bay 1 is unofficially a nudist beach, so families, younger visitors, and those who prefer to keep their clothing on are encouraged to focus on the other bays. Popular activities at Jacob Riis Beach include simply sunbathing and enjoying the sand on sunny days, as well as swimming or paddling in the waters of the Atlantic Ocean, but swimming is only allowed when lifeguards are around. There are plenty of amenities to be found at Jacob Riis Beach to make your day on the sand as fun and stress-free as possible. The recent renovations to the area included the construction of several new concessions and rental stands. Chairs and beach umbrellas can be rented via the boardwalk area, and items like these can also be purchased from certain stands. Restrooms and showers can also be found along the beach, and the new and improved Riis Park Beach Bazaar offers a lot of tasty snacks and refreshments of all kinds, including typical beach fare like hot dogs, ice creams, seafood, ice pops, and more. Jacob Riis Beach is busiest in the period of the year from Memorial Day through to Labor Day, and this is the only time food and beverages can be bought from the various stands. This is also the only time of year when lifeguards are on duty, so if you want to do some swimming at Jacob Riis Beach, you'll need to do it between the end of May and the beginning of September. If you find yourself in need of snacks or other services at this New York City beach at another time of year, it's only a short trip along the coastline to the Rockaways, where several great eateries can be found on the Rockaway Beach Boardwalk.